should start with a short explanation. My plan for this month was a review of Nagra system but, as it happens from time to time, even if you plan something meticulously some things just happen and... you need to change your plans. Hopefully Nagra review is just postponed, not canceled. I didn't have much time to find a replacement and I want to use this opportunity to thank Mr Maciej Chodorowski from Soundclub for his prompt response to my request. We talked already during last AudioShow about future test of some Brinkmann products but it wasn't yet exactly planned for particular month. So once more – thank you for helping me out even though the time was really scarce. As a great vinyl fan I am particularly happy each time when a new turntable/tonearm/cartridge brand arrives to our Polish market. It doesn't really matter whether this is something affordable from my point of view, or not. What matters is the performance, not the price. Over last few years we've seen many brands finally appearing on our market simply because the growing popularity of vinyl and vinyl playback forced almost each „respectful” distributor to comply with growing demand. That has given vinyl fans a wider choice and us, reviewers more chances to get familiar with different devices and to gain experience while reviewing different types and makes of devices. Last Audio Show gave exhibitors another opportunity to present some new brands/models, and one of the distributors who took this chance up was Soundclub. Not only did they surprise most visitors with Cessaro speakers presentation, but also with having a top model of turntable by the renown German manufacturer, Brinkmann. From the moment I entered Soundclub's room I knew that sooner or later I would have to get my hands on at least one of these beautiful turntables. I always try to plan my reviews months ahead and as I had already had several tests planned I couldn't at this particular moment agree either object nor timing of a Brinkmann's review. But I kept it in my mind so when opportunity presented itself (by Nagra's misfortune) I grabbed the phone and called Mr Chodorowski. Not only Soundclub acted on my request immediately but they decided to equip me extremely generously. They brought Bardo turntable, two tonearms: 10.0 and 12.1, each of them fitted with a cartridge (respectively): Π and EMT-ti. Additionally they gave me also Brinkmann's top tube phonostage called Edison, and like that wasn't already much more than I'd asked they brought three (!) different power supplies for a turntable, including the top of the line, tube one called RöNt II (13 kPLN). The latter was sort of „overkill” - after all Bardo is an „entry level” turntable for this brand, and this particular power supply was created for a top model, Balance. But what the hell! I said to myself – that would be a lot of fun to try it all out! The only thing that really bothered me was a limited time I had to perform my test. Are you familiar with the term “High Fidelity”? We are strictly referencing the ideal of perfect music playback, in essence making it indistinguishable from the original. 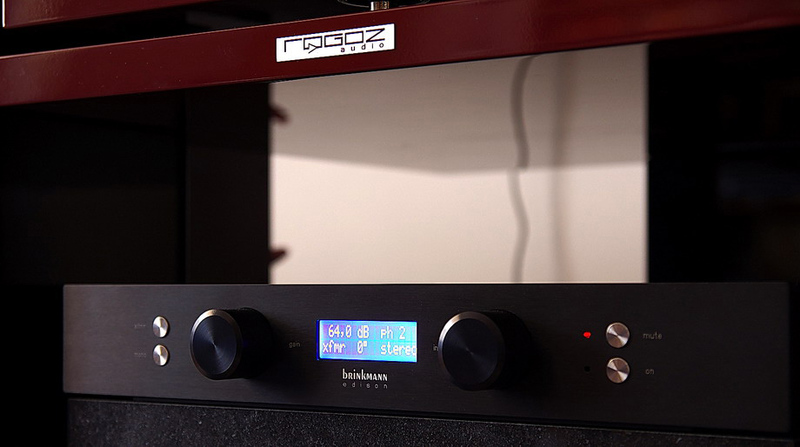 For Brinkmann, “High Fidelity” stands as the ultimate pinnacle of achievable sound reproduction. Simply put, there is nothing better than “High Fidelity”: after all, a facsimile can never sound better than the original. Having said that, we caution you not to be confused by the use of such marketing terms as “High-End”; “State of the Art” or “Ultra-Fi”: these terms simply stand only for what is currently technically feasible. Actually, you will be surprised to hear that one of the more funny oxymoron’s in music playback history is the so called “Hi-Fi Norm, DIN 45500 (German industry standard term)” standard. This “standard” which dates back decades is the ultimate proof that it has nothing in common with what is technically possible. One day, as Helmut Brinkmann was looking through his microscope, he noticed that the three tiny screws which serve to adjust the cantilever on an EMT cartridge are made of steel. He then asked himself whether a magnetizable material so closely surrounded by powerful magnets was really that clever of a design idea. One by one, he replaced these tiny steel screws with ones made of aluminum, brass, nylon, titanium, and many other even more exotic materials. Next, he spent countless weeks performing critical listening tests. As the listening sessions progressed, he became more and more astounded by just how much the sound quality changed as he replaced such a seemingly trivial element. After all, these very tiny screws measure just a mere 1mm in diameter! At the end of his exhaustive research, he concluded that the sound resembled the original most closely when only one of three screws were replaced by a model manufactured of titanium. (By no means is this example a one-off experience: in the end, perfect music playback is a careful optimization process that involves 0.1% inspiration and 99.9% perspiration. As they say, for High Fidelity to truly shine, you need patience, diligence, more patience, a dash of tenacity and of course even more patience – not to mention many tiny screws made of exotic materials). To be honest I was already „bought” after reading just these two sentences: „We have come to the conclusion that everything has an influence on sound. And we have to accept that these influences are real – even if (for the moment at least) we have no scientific explanation.” This philosophy reminded me of what I read in one of the interviews with Peter Qvortrup (Audio Note UK) – another true engineer, who's ultimate goal is to find a scientific way to measure sonic differences that he can hear. According to him a fact that we can't measure something today doesn't mean it doesn't exist – we still might find a way to measure it, or maybe first figure out what it is that we should actually measure. An engineer saying something like that – I like him already even though I've never met him personally. Brinkmann's products are surely not „mass-manufactured” ones. They are hand made – not literally as most parts are manufactured using machines - premium class products, with top class make and finish. Quality check of each manufactured items is done by the designer himself – if you read about his philosophy as I did you most likely saw that coming. Many parts of turntables and tonearms have to be manufactured with the utmost precision that can be guarantied only by machines. But still the final product's quality check has to be performed by a man and who's better qualified than Mr Brinkmann himself? - Accurate and consistent speed. - High level of immunity from external and internal vibrations. - Ultimate quietness and low friction of platter and tonearm bearings. To fulfill those criteria German manufacturer offers complete solutions where the whole is greater than the sum of its parts. 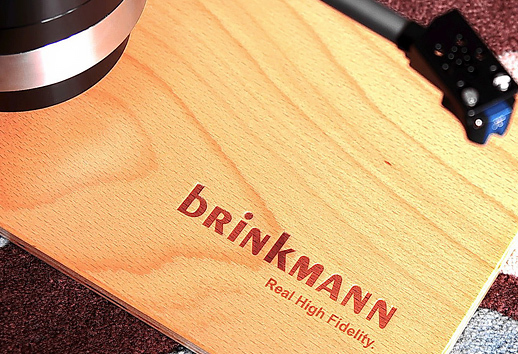 It's customer's choice whether he buys the whole package from Brinkmann or just part of it but a complete solution should result in synergy which might not be a case if you fit, for example, their deck with some other arm or cartridge. Considering how much attention Mr Brinkmann pays even to the smallest details of his designs I'm inclined to take his word for it. Lets have a closer look at all the Brinkmann's products I got my hands on. The deck, called Bardo is an entry level one in company's portfolio. In some way it reminded me two other entry level decks I reviewed recently – the Avid Ingenium and Kuzma Stabi S. In both cases these decks sport a simple, non-suspended, „T-shaped” (at least if you have enough imagination) chassis with platter installed at one end and tonearm at the other. In Bardo's case you'd have to have even more creative imagination to say that its chassis is „T-shaped” as both end are round and one of them (the one under the platter) is bit wider than the other end (so it's more like a tear, or water drop, I guess). Bardo's chassis is made of duraluminum (Avid's of aluminum, Kuzma's of brass). Unlike the other two, Bardo sports three adjustable, metal feet, plus a granite plate to be put under is also a part of a package. To spare my rack from scratching I used additionally Slim Discs from Franc Audio Accessories under the granite slate. Not only did they keep gloss surface of my rack safe, but provided Bardo with additionally resonance isolation – that's a thing they excel in placed under any audio equipment. The granite slate almost doubles the total weight of turntable - chassis weights roughly 15 kg, aluminum platter with polished crystal glass surface adds another 10 kg, and the slate – that's at least another 15 kg. An interesting solution, highly acclaimed when firstly used in Oasis table, is a direct drive. Yup, that's right – this is a direct drive deck. Fact that most manufacturers use belt drive in their designs doesn't mean that this is the only „proper” solution. The platter is driven (via subplatter) by a Sinus motor, designed and manufactured in Brinkmann's factory, that is placed underneath platter. The other interesting solution is a circular platform that accepts machined-aluminum armboard (and you may order armboards for different arms) inserts that can be rotated to achieve the proper pivot-to-spindle distance with a wide variety of tonearms. After proper distance is set armboard is secured with three locking bolts. 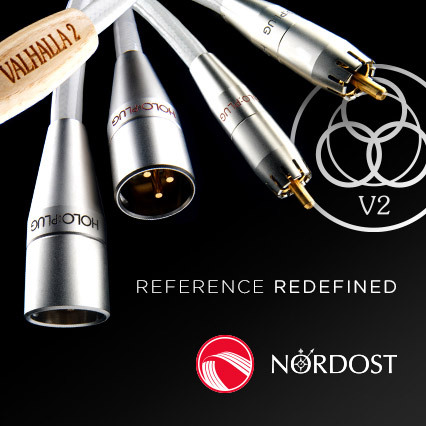 There is one more interesting choice manufacturer made – he doesn't use any of most popular tonearm alignments like Lofgren, Baerwald, or Stevenson. Brinkmann decided to use Dennesenn alignment protractor and he offers a nice looking, precisely machined, metal one. It makes user's life easier as all you have to do is to check alignment in just one spot, not two like with other protractors. On the front of chassis you will find a switch that allows you to chose between 33 or 45 r.p.m. – it takes several seconds before speed stabilizes at proper value so you might want to wait a while before dropping stylus into the groove. At the back of chassis there are RCA output sockets and a ground pin. The Edison phonostage is probably offered rather with Brinkmann's more expensive tables – at least I assume that considering its price. It's a tube based devices with three (!) fully adjustable inputs, which means you could use up to three arms. Additional interesting feature is that two out of three inputs accept both RCA and XLR cables, only the third one accepts only RCA. There is only one output and its sports only XLR sockets. Edison works with both, MM and MC cartridges. Input impedance can be adjusted using small trim pots placed next to each input (so you can set different impedance for each input), and the gain can be adjusted with a knob placed on the front of the device. Present value is presented on a display. That's a very smart and handy solution allowing user to easily find the best balance between phonostage's gain and preamplifier's gain. Bardo is equipped with a small, solid power supply in a nicely finished metal case. One of the upgrades one might use for Bardo is a more advanced power supply – a standard one used for top model, Balance (with this one what you get is called Bardo Performance). I received such a PS too. For most demanding Balance users Mr Brinkmann created another power supply – a tube based one (also delivered for this test). 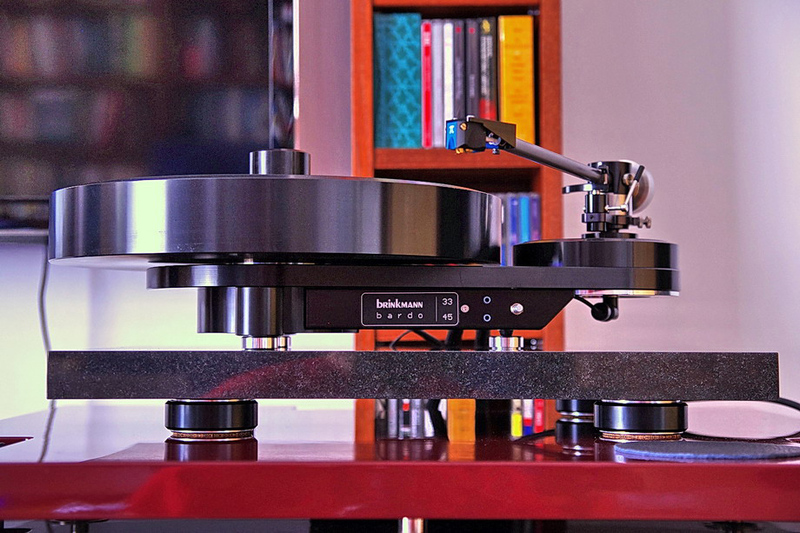 Unless customer wishes otherwise Bardo is delivered with 10.0 tonearm with Brinkmann's own MC cartridge called Π. Our Polish generous distributor supplied me also with Brinkmann's top arm, 12.1 with modified EMT MC cartridge. Muddy Waters, Folk Singer, Mobile Fidelity MFSL-1-201, 180 g LP. Rodrigo y Gabriela, 11:11, Music on Winyl MOVLP924, LP. Paco Pena & His Group, Flamenco puro „Live”, DECCA PSF 4237, “Phase 4 Stereo”, LP. Inga Rumpf, White horses, AAA 0208574CTT, “Triple A series”, 180 g LP. Miles Davis, Kind of blue, Columbia CS 8163, LP. Możdżer Danielsson Fresco, The Time, outside music OM LP002, LP. Jacintha, The best of, Groove Note GRV 1041-1, LP. Tsuyoshi Yamamoto Trio, Midnight sugar, CISCO TBM-23-45, LP. Metallica, Metallica, Vertigo 511831-1, 180 g 45 rpm, 4 x LP. I was very happy about the generosity of Brinkmann's distributor but on the other a limited time I had at my disposal forced me to limit numerous possible combinations, to simplify my work somehow. So I started with quick deck's power supplies comparison. I was trying to find out whether I could hear differences between them (with 10.0 arm and Π cartridge). To be honest whatever differences I heard were not significant (remember I had to do it quickly). Yes, each more expensive PS added some more stability to the sound, possibly bit more authority to the bass and darker background (although already with the basic PS I'd thought it was pitch black). I guess the more expensive, more sophisticated turntable, the higher overall transparency of the whole system the more obvious, more distinct the improvements would be and the more reasonable would buying the top PS be. I'm not saying that buying RöNt II for Bardo is pointless. Somebody said once that (it's not an exact quote) „even the slightest improvement of sound quality that allows us to enjoy listening to the music even more is worth spending any amount of money” - and while I agree in general, but in this particular case I believe that replacing 10.0 arm with Π with 12.1 with EMT-ti while causing similar damage to one's bank account will offer a greater impact on sound quality. I was able to benefit from having all three power supplies at my disposal and after spending some time with basic model, than basic model for Balance, I finally settled on the most expensive tube PS, why wouldn't I? :) When it came to tonearms it was much simpler. Installing them both at the same time wasn't an option so I started with 10.0 and than, after couple of days, it was replaced with 12.1. Comparison between arms was difficult since each arm was fitted with different cartridge – respectively with Π and EMT-ti – both moving coil types. Let me start with my impressions on 10.0 with Π (I will not go into details concerning small differences between power supplies). It took me a while before I was able to write the first sentence. For a long time the only thing that came to mind was that Bardo sounded... accurate, exactly accurate. Just that. But do you actually need more? Yes, I know – one word as the whole review, that doesn't work. But it described exactly what I felt after spinning some of my favorite vinyls. Usually each turntable I start to audition offers some distinct sound quality, something that makes it different than competitors, creates so important first impression and that (at least) initially describes its sonic qualities. This time the only „first impression” was one of some sort of wobbling sound – this deck simply needs several seconds to get the heavy platter to spin with proper speed. Once the speed stabilized I couldn't really detect any wow&flatter anymore, or any other signs suggesting that this direct drive could be in any way inferior to belt drive. Obviously this particular direct drive was very well-thought-out and refined. Many inexpensive turntable use high torque motor that drive very light platters which leads often to rather poor sound. Brinkmann's motor, called Sinus is a low torque one and it drives a 10kg heavy platter. The main bearing is almost friction-less so once the proper speed is achieved it can be easily sustained (you can check how good the bearing is after you turn the power off – you can witness how long will the platter rotate). Another interesting choice Mr Brinkmann made was an analogue speed control, as he believed that radio-frequency interference form digital system could negatively impact sound quality. OK, let's get back to how it sounds. Accurate. I mentioned that already more than once. As I am more of a music lover that audio equipment junky I always hope when starting an audition of some new item that it will take me into some wonderful music voyage and will make me forget about sound quality assessment. And while the percentage of turntables that do just that is surely higher than of any other type of audio equipment it still doesn't mean that all of them do just that. Luckily this was one of those good times.